+How do I purchase Graf Custom Hardwood? View our distributors page to find a distributor closest to you! +Why does my hardwood flooring have small gaps between the boards? Wood floors will shrink and expand with changes in humidity. This can cause small gaps in your flooring. To reduce this from happening humidity control is recommended. Hardwood Flooring is a long term investment that with correct maintenance can last the lifetime of your home. Preventive maintenance is the key to a beautiful long lasting finish of your hardwood flooring. Routine maintenance involves protecting the finish from scratches and moisture. Basic maintenance involves protecting your flooring finish from scratches and moisture. If you can avoid both of these things you can prevent the most common damage of hardwood flooring. This will extend the life of your finished hardwood flooring for a lifetime of home use. +Why should I use area rugs or throw rugs on my hardwood flooring? Use of area rugs or throw rugs at areas of entry can help to reduce the amount of dirt and grit that will come into direct contact with your finished flooring. +How can I prevent dents from occurring in my hardwood flooring? Floor protector pads should be installed on the bottom of all furniture legs before furniture is placed onto the wood floor. Using floor protectors under your furniture will help protect your flooring from surface damage especially on heavy pieces of furniture such as couches, tables and beds. Using furniture moving pads to move furniture for cleaning will also reduce the risk of any scratches occurring to your flooring when moving furniture. +Can I wear shoes on my hardwood flooring? All shoes, especially high heels, should be kept in good repair. It they lose their protective cap they will dent the surface of any floor. +Can I have pets with hardwood flooring? Wood floor owners with pets will need to regularly trim the pet nails to avoid scratches to their flooring surface. You will also need to clean up any accidents immediately so that they do not sit on the floor surface. Pet stains can cause permanent stains that are not covered by manufacture finish warranties. It is best to place a mat under any pet food and water bowls to prevent any water damage to your flooring. +How do I clean my hardwood flooring? Routine sweeping, vacuuming and/or dust mopping to remove dirt and grit will prevent to majority of scratches from occurring to your flooring. Floors should be cleaned immediately before and after a major event. Improper product use can damage your flooring finish so it is important to use the correct cleaning method for your type of flooring. To ensure you use the correct product for cleaning your hardwood flooring you must first determine the type of finish that is on your hardwood flooring. It is very important that you follow the manufacturer’s recommendations to maintain your specific flooring surface finish. +What type of finish is the Prefinished Collection offered by Graf Custom Hardwood? Our prefinished flooring is finished with Bona Naturale. Here is the link to the bona website for your care recommendations per the finish supplier Bona. +Where can I purchase Bona cleaning products to clean my hardwood floors? Bona cleaning products can be purchased at most local retailers and home improvement centers and online. +Why is my finished flooring darker in the area where I had an area rug covering my hardwood flooring? Area rugs often cause color differences to the floor due to differences in light exposure. Over time the dark area where you have removed the area rug will change color to catch up with the rest of the floor once that area of the wood flooring is exposed to light. Wood is a natural product and will be affected by exposure to light rays which will cause the flooring to change color over time. This can be slowed by the use of UV Blockers that are contained in some finishes. Other ways to prevent color change is the use of curtains, blinds or sheers on your windows to reduce the exposure to direct sunlight. Another option is to have a UV blocking tint applied to your windows to reduce the amount of light ray exposure to your flooring. +Can Radiant Heat Sub Floor be used with your flooring? Graf Custom Hardwood Engineered Hardwood products > ½” thickness is approved for installation over radiant heated subfloors by use of adhered installation method as applicable for the product. Please reference the Graf Brothers Engineered Flooring Installation for further details of the installation recommendations for product installation over radian heat sub flooring. Radiant heat systems are not recommended to be used with our ¾” solid wood flooring. +Can hardwood flooring be installed over concrete? Engineered wood floors can be installed successfully on, above or below grade level. Engineered wood floors can be installed directly to a concrete or wood subfloor. ¾” solid wood flooring is not warranted for installation over concrete. +What species of flooring are offered? Graf Custom Hardwood offers White Oak, Red Oak, American Black Walnut and Hickory. These products are offered in both ¾” solid and as engineered product options in 5/8” or ¾” thickness. +What widths of flooring are offered? Standard widths are 2 ¼” up to 8” wide. Widths of 9” and wider are offered on a special order basis in both solid and engineered products. +What grades of flooring are offered? +Can I get longer length flooring options? Longer length flooring is available in both solid and engineered options as a special order item. +Can I get wide width flooring? Yes we offer widths up to 11 ½” width on a per quote basis. Please contact your sales representative for product availability. +Can I buy unfinished hardwood flooring? Yes both our solid and engineered flooring products are available as unfinished flooring product. Unfinished products will require on site sanding prior to any finish application. +What is the advantage of Rift and Quarter Sawn flooring versus Plain Sawn cut? Rift and Quarter Sawn material provides customer with a unique appearance that sets it apart from plain sawn material. Quarter Sawn material has beautiful fleck that goes across the grain giving a “tiger strip” appearance to the surface of the wood in the White Oak and Red Oak species. Rift and Quarter sawn material is more dimensionally stable than plain sawn material making it less likely to cup, twist and warp. Due to the dimensional stability of the product this material is idea for use in wood flooring and furniture projects. +How long does my flooring need to be in my house before it can be installed? Wood flooring needs to reach moisture content level in equilibrium with the surrounding environment in which it will be installed, at or near normal living conditions. Not properly acclimating/conditioning wood flooring may cause excessive expansion, shrinkage, dimensional distortion or structural damage. Acclimation times will vary depending on your specific geographical region. +What is an edge treatment? An edge treatment is a way of removing the square edge of a finished floor that is not sanded on site. There are multiple edge treatments available to achieve many different looks for your overall product design. The edges are beveled at a 45 degree angle removing the square edge of the product which helps to reduce splintering and over and under wood that can occur with uneven subflooring. Eased edge or rolled edge is another edge treatment option. 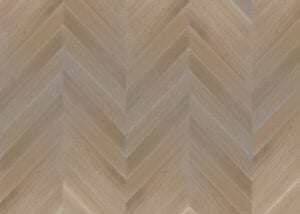 +Can I buy prefinished flooring with a square edge – no bevel? An edge treatment is required for a prefinished floor because prefinished flooring is not sanded on site. When you lay unfinished flooring on site it is sanded to an even surface. That is not the case with a prefinished floor installation. An edge treatment will hide the unequal heights (over wood and under wood) of the prefinished flooring pieces. There are multiple options available in various sizes to work for your overall desired product look. The smallest of these bevel sizes are a 1/16” micro bevel which is the most requested bevel size option. +Can I refinish prefinished hardwood flooring? Most prefinished flooring can be refinished depending on the condition of the flooring. You will need to determine the type of finish on the existing floor to be able to determine what steps will be needed for preparation of the material for prefinish. If you are unsure of the original finish you may need to contact a flooring professional to for determination of the coating on your existing floor. +Can damaged hardwood flooring be repaired? Most hardwood flooring can be repaired depending on the damage that has occurred. Water damage typically is non repairable however if damage is isolated to a few boards a board replacement may be able to be preformed. You will need to contact a flooring repair specialist to determine if the flooring is eligible for repair or replacement. +Can I install hardwood flooring on any level of my home? Engineered Wood Flooring was created to be able to use on areas of your home where a wood floor is desired but conditions are not suitable for installation of the ¾” solid wood flooring such as below grade installation or over concrete slab. Engineered wood floors are real wood floors that are manufactured using multiple layers of wood veneers. The grain of each layer runs in perpendicular directions, which creates exceptional dimensional stability. This means the wood will expand and contract less than solid wood flooring during fluctuations in humidity and temperature. The top wear layer of engineered wood consists of high quality wood. Engineered floors can be nailed or stapled to a wood sub-floor, or glued down to a wood subfloor or concrete slab. This makes engineered wood floors ideal for slab and basement installations, but they can be used in any room either above or below grade. +Can I refinish engineered flooring? Engineered flooring can be sanded and refinished in the same manner as solid wood flooring due to the thickness of our 4MM wear layer. 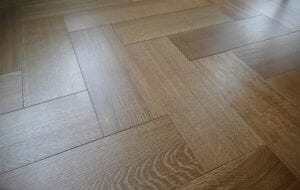 +Can I buy unfinished engineered flooring? Yes, engineered flooring is available in both unfinished and prefinished options.